Partner print to the G2 Optimus Prime I posted earlier; both Prime and Megs are saying their lines from the G2 commercials. Make a ton of cack? This pic represents everything that is awesome about G2 Megatron, good job . He believes peace can be achieved through tyranny. Love this! Everything about this has that 90's feel just by the way it's drawn in that style. Wonderful work! G2 was always amusing, because of the LOUD COLOR SCHEMES. Nothing says "Robot in Disguise" than a brightly, day-glo colored car with "AUTOBOT" stamped on it. I see that you italicized the faction symbols, too. That detail always confused me on the fiction. haha- I guess them being skewed looked EXTREEEEEME! MS Paint skewing was cool back in the 1990s? Ha ha ha ha, I totally had one of those. I used his cannon to target Voltron in the chest. Hit his emblem every time. Both this and the Optimus one are fantastic. Love this style and would enjoy seeing more characters in it. Awesome, this brings me back. 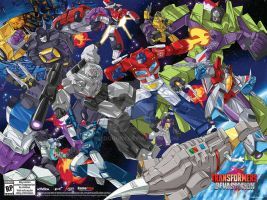 I remember owning both Prime and Megs. These two prints are absolutely fantastic. Though I've been expecting this level from you.